32 Responses to "2011-2 Les Mills posters"
A bit of a turn-off. What’s the brick wall got to do with anything? Someone will be left with the impression we train in a basement garage. I’m quite disapointted. Especially bj-poster is lame, is seems like those two people are floating in the air and that’s not the point at all! Bodyjam is pure movement with happiness and joy. You can’t guess that, if you are looking that picture. They looked horrible… sorry to say it. As I wrote also to FB: The only thing that I don’t like is that I see again BC: max 545 calories!!! When they give tho Sh’bam (45 minutes class) 600 calories. Why do you not take pictures of instructors from the active class. Are there any posters of Sh’Bam and CX30? Yeah not a fan. Even though I’m biased towards BC anyway, I do like how that one contrasts the last 2 seasons outfits. I agree with the others – they are terrible!!! 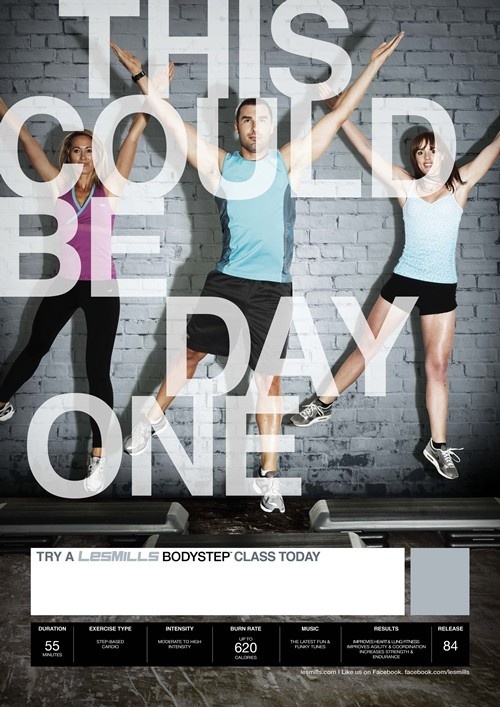 I mean who at Les Mills NZ thought they looked good? 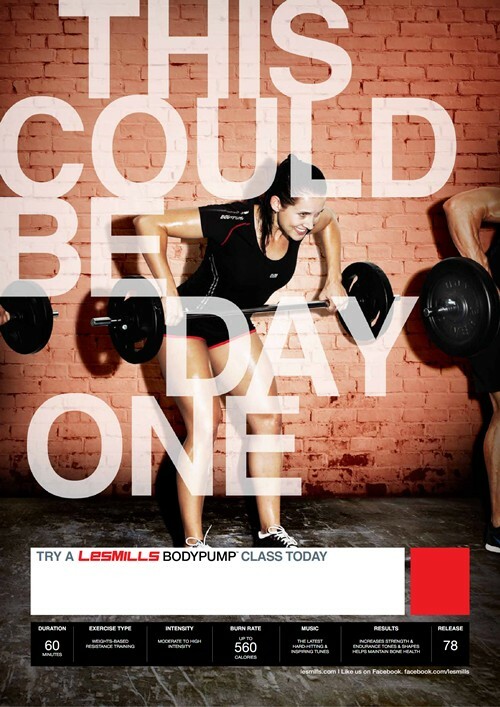 Sorry Les Mills, but these are just plain BAD! Ugh, do not like AT ALL. And I especially am peeved that they didn’t even use unique phrases – RPM and Combat are the same, as are Step and Pump. Never mind how the Vive poster doesn’t even show them ‘doing’ Vive, just setting up the band underneath their foot preparing for conditioning work. haha, just did BA77 for the first time and it was EXACTLY as i imagined a little over a year ago!!! I kinda like them. But I do wish each program had a unique phrase. These are an epic fail on many levels. The calorie count is the biggest issue for me. I use a heart-rate monitor every time and in Combat I always burn around 900. I even reset it and lent it to one of my participants with a very similar response. Let’s face it, most of us reading this blog would go to a class even if the poster was just a Post-it note with black marker so we’re not the target market. They’re designed to get complete LM novices thinking about giving the classes a shot; although the Attack one might have been better on a less intense program. The odd calorie counts don’t help in that respect though particularly Combat’s. The others (well, Attack and Pump) are slightly higher than my HRM usually reports but Combat is well below. I know LM possibly err on the side of caution for calorie count, but it’s frustrating listening to the Zumba instructor rave on and on about how Zumba burns waaaaay more calories than any of the LM programs. Posters get a big thumbs down from me. Regardless of the calorie counts, the artwork is just dull and flat. I really really liked the quarter with Pump 74, Attack 69, etc… Those ones were really cool. Seems to me they’ve taken a step backwards ever since, especially since the last 3 quarters have all looked exactly the same. I like them. They are fresh and current in look…they also bear a great resemblance to a previous “American Apparel” campaign. Perhaps targeted at a younger crowd? I do agree with you on the slogan for the Attack poster, but I like the approach on the others of “You are only new the first time”. 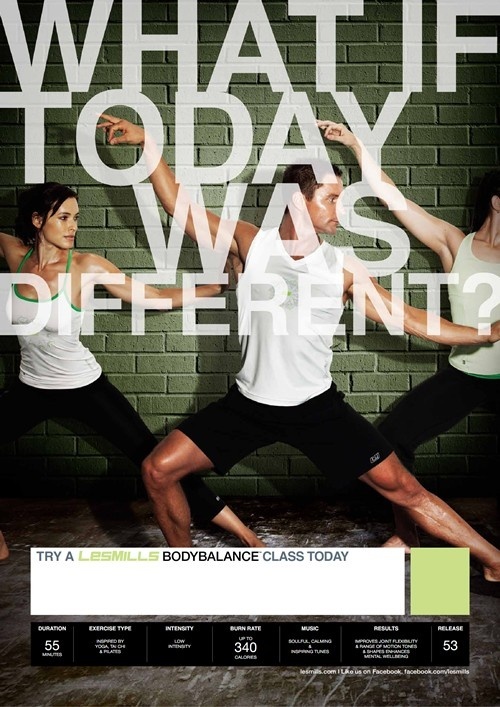 As a Balance instructor, ours really speaks to me… in fact, I love it! After looking at the posters again I think there is 1 main problem with them and that is the writing over them – it’s far to big and hides the people underneath who are actually supposed to be showing what exercise class they are doing – because unless you read the small writing in the white box near the bottom (‘try a Les Mills ……. class today) you don’t actually know what they are advertising. Yeah, my first thought was: “Who the hell designed these?”… It’s horrible how they’ve added text over the people’s faces. That’s a big no-no and pretty much is the main reason why they’re not good. 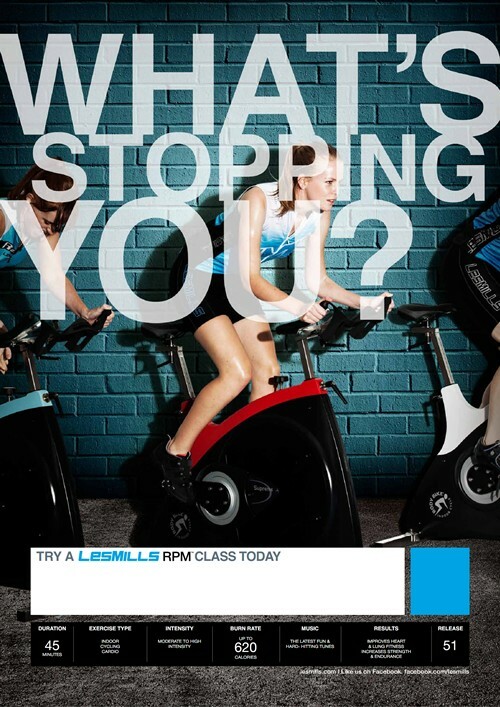 The calorie count… Oh my god, Les Mills, thought you learned from the previous quarter. Even our Les Mills agent said to us to ignore the count on the posters. Also they’ve cut limbs off… Another “no-no” most of the times. Hmmm…I would have liked clean pictures not having the text killing it. To fussy! And how come it says DURATION: 55minutes for the BC poster when the 2 previous releases have been well over 55 min. Is BC 48 shorter? At least they’re showing a good HARD move in the Attack creative instead of a knee lift or something not that exciting/intense……. I’m confused about the calorie counts as well…545 for BC? I may as well go for a walk for an hour and a half. And yes, I’m not enthusiastic about the posters either. I think that are so much better than the previous release, for example, the last poster of Body Jam and Body Pump LM use the same pictures of the last releases and the pose of the pictures of this posters wasnt the best. Hey and what´s up with Sh´bam and CX30 posters? Nice use of typography, the colour palates used are consistent with previous branding. Nice grungy look and feel. 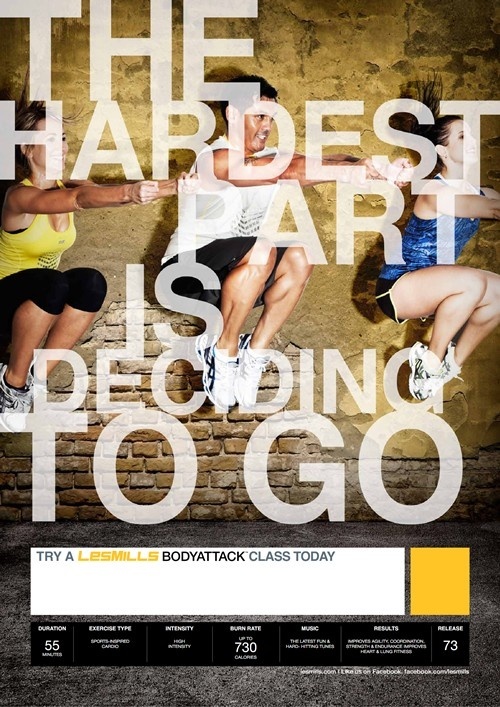 Les Mills always employs great design agencies to do these posters. My only critique is that the typography does invade the image somewhat. Just a little more use of of levels on the overlay should knock that on the head.